DADS STUFF – Why did you choose STRONG as your fitness regime? BRAD – I was hesitant as initially the whole “Zumba” concept made me think it was dance related – I was so wrong! I did a trial class back in April 2017 and have loved it ever since. I’ve also done the STRONG by Zumba® training so I’m now a qualitied instructor too! It was perfect for me, because I had been doing boot camps and HIIT training on and off for a long time and the music element of STRONG by Zumba® stood out amongst all the programs on the market. Great Music, Great Workouts, Great concept! DADS STUFF – What is it about it that you like? 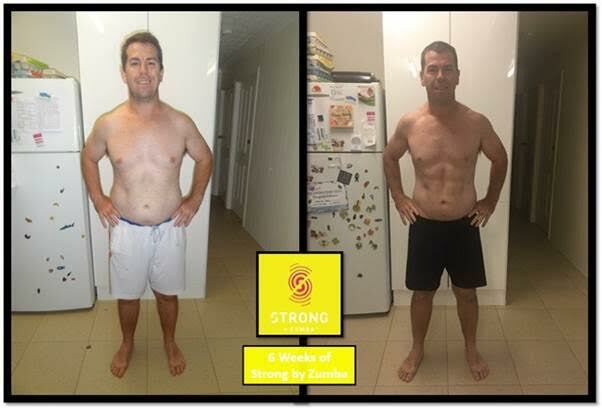 BRAD – There are 3 key aspects of STRONG by Zumba® that stand out for me. The music element of the program is absolutely genius at it makes the workout much more interesting. It’s not boring or repetitive and it makes you forget that you’re in the middle of an intense full body workout. Secondly, there are not many programs, if any that can make you burn up to 1000 calories per session. In an hour, you’re able to burn a lot of calories then you would in a typical HIIT workout class and the after-burn effect means you’ll continue to burn calories long after you have completed the workout. STRONG by Zumba® also offers a variety of exercises which targets each muscle group effectively. The workout is split into 4 quadrants and each quadrant focuses on a different muscle group (e.g. quadrant 1 currently focuses on legs, 2 and 3 focus on full body and 4 on abs and arms) to ensure your whole body is put to work. I have seen a huge physical change – I have abs now! I’ve lost 7kg doing the STRONG by Zumba® program. In April I was 98kg and now I’m hovering around 91kg. My general fitness has improved substantially and I feel fitter than ever before. STRONG by Zumba has taught me the correct technique for each exercise. I can now do, with proper form, more push ups now than I ever have before. DADS STUFF – Are there many men in your class? BRAD – Not a lot of men have tried the program. I don’t know if it’s the thought that the word ‘Zumba’ means dancing, or whether the city I’m from has a very busy market around personal training, boot camps, cross fit and social sports. The men who have tried the class however have certainly commented on the intensity of the workouts and how it really pushed them more than they thought it would. DADS STUFF – What is STRONG by Zumba? JARROD – STRONG by Zumba® is a non-dance, music-led, HIIT workout which combines body weight exercises with muscle conditioning, martial arts and plyometric training moves specifically designed and synced to original music. The routines are created first and then music is reverse-engineered to match every move perfectly, for a unique workout + music experience that pushes you past your perceived limits. This new concept which emphasizes music as the main motivator allows you to burn more calories while toning abs, legs, arms, and glutes. The songs created especially for these classes are reverse-engineered to match every move in class. This is a first in fitness, where routines are elevated through music to push participants past their perceived limits for a much more effective total body burn! Participants can expect to burn up to a staggering 1000 calories in a session. DADS STUFF – Why does it appeal to both men and women? JARROD – STRONG by Zumba gives participants a full body workout, mixed with intense cardio, bodyweight training and plyometric movements that are fit for any gender, male or female. The experience is really a hybrid of many movements (core work, martial arts, balance and flexibility, cardio, and kick boxing). The class will help increase endurance, flexibility and mobility; and then there is the role that music plays – because each sound is synced around the movement, you’ll actually push yourself harder and see results way after the class is over. So the question really is not about who can take this class, but rather why? And it’s because the results are unparalleled to any other workout. You’ll feel empowered and full of energy. DADS STUFF – What other exercise should men do to compliment a weekly STRONG class? JARROD – Life is all about moving and keeping yourself from getting bored when it comes to workouts! While STRONG by Zumba provides a full body workout, it’s important to try and move anywhere and everywhere, from going for a jog, to taking a yoga class. The body is the best tool you can have, and the best thing about this class format is you can start as a beginner and then graduate into more advanced moves. The music will always be there to motivate you and you’ll definitely see yourself getting better and more advanced as the class goes on. You can read more about STRONG by Zumba right here.